Timothy Masso is passionate about his Tla-o-qui-aht culture and language. He has grown up steeped in the cultures of his Nuu-chah-nulth father and Norwegian/English mother. Masso’s older brother, Hjalmer Wenstob, is an artist who owns an art gallery where he sometimes teaches Timmy how to carve. Together the brothers learn about their culture, language, songs and stories. Masso says it was during a health crisis Hjalmer had in 2016 that he saw the power of the Nuu-chah-nulth language and began falling in love with it. Wenstob was hospitalized following brain surgery; concerned family members brought in elders in to pray for him and brush him (cultural cleansing practise). “I saw the strength it brought and when I went home I wanted to learn the language so bad,” said Masso. So, when he got back to school, Masso was pleased to know that he could sign up for 8th grade Nuu-chah-nulth language classes. “I was so excited that I could learn this at school, but it turned out it wasn’t a language class, it was just a spare block,” said Tim. Masso learned that the school didn’t have anyone to teach the class. Having taken a couple of courses offered by Quu-quu-atsa Language Society three years before, Masso approached teacher Mr. Kevin Nixon with the idea that he could teach the class. Nixon agreed and 13 year-old Tim began teaching his peers the Nuu-chah-nulth alphabet and root words. It wasn’t long before Masso saw that there was a need for more resources to save the language and, with the support and encouragement of his mother Jessie, Tim left school to become an advocate for saving the Nuu-chah-nulth language. In 2017 Tim attended the Assembly of First Nations Annual General Meeting where his brother Hjalmer was retiring from his role as BCAFN Male Youth Representative. 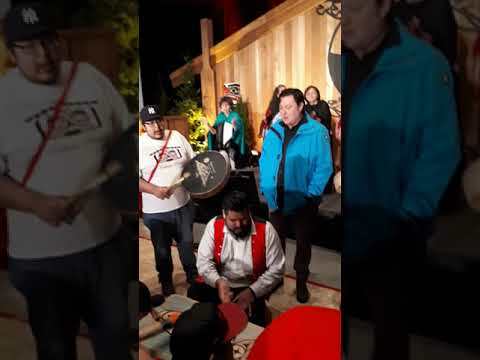 With then federal Minister of Indigenous and Northern Affairs, Carolyn Bennett, in the audience, Masso made an impassioned speech to let the crowd know that in terms of language, we are not doing well. Taking him aside, the minister promised Tim that she would do her best to help, but said she would need his help as an advocate. Masso has traveled around Canada and Washington State advocating for language resources while being home schooled. Now in the 10th grade, Masso, who describes himself as an aspiring dancer, is not afraid to reach out for help when he needs it. He always has his older brother Hjalmer to turn to, and he also has his parents Trent and Jessie Masso. He said he will ask his father things, and if his father doesn’t know the answers, he will ask his mother. If she doesn’t know the answer, she gets to work finding out. One of the projects Timmy and his mother collaborated on was the creation of a set of Nuu-chah-nulth language blocks. “We wanted to find a way to help people learn the Nuu-chah-nulth alphabet and we were inspired by children’s toy blocks,” said Masso. There are up to 45 letters in the Nuu-chah-nulth alphabet, depending on which dialect you are speaking. With six sides to a block, Masso created a set of 16 blocks to be used as teaching tools. Timmy, with help from his mother Jessie, made several sets of blocks. At first, they made the letters on the blocks by hand using Sharpie pens. Now, they have stamps and an ink pad which significantly reduces the time it takes to produce a set of blocks. Masso gave 10 sets of blocks to Tla-o-qui-aht to be used in their preschool and language nest programs. He has made an additional 50 sets in his brother’s workshop and hopes to make another 300 sets by mid-November. Masso gave several sets of blocks as gifts to his mentors at the gathering. Timmy wrapped up his teaching career at Ucluelet Secondary School after three months – at least for the time being. In Jan. 2017, he signed up for a two-year diploma course called Aboriginal Language Proficiency and Revitalization. The 10th grade student says this course will earn him University of Victoria credits. He notes that one of the barriers to elders teaching the language is the school district requirement that language teachers earn Bachelor of Education degrees. “It is important to fight for the rights of elders; they can’t teach without university degrees,” said Tim, noting that it takes years to earn a degree and time is running out. Ucluelet Secondary School now has a certified teacher working with SD70 Linguist Adam Werle. Together, and with other teachers, they are preparing Nuu-chah-nulth language courses for the high school students. “Even though I don't have a language class in school for grades 10 through 12, I am taking the grade 9 language class, and it’s really exciting to see how fast kids are learning our language,” said Masso. He went to say that there are thirteen kids in the class. “This year there has been such a huge interest in Nuu-chah-nulth that French is no longer available; I thought it would be good to mention this because I really enjoy it,” said Masso.